Hangouts for Android devices will be losing SMS support on May 22. An email sent to G Suite administrators says that, later this spring, you’ll no longer be able to send and receive ordinary texts through the app. Hangouts will start showing notices of the change in the app on March 27 before pulling the plug two months later. Users are being redirected to Android Messages and other apps with SMS support, but anyone using Google Voice and Project Fi will go unaffected. 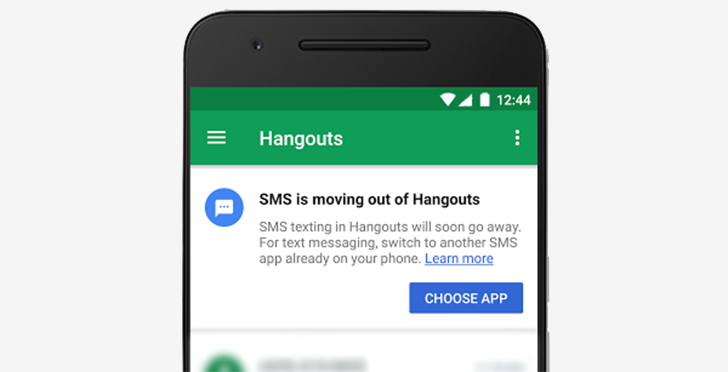 Hangouts is needed or those services to continue operating in their current states. The reason for Google making this change is Hangouts’ pivot to focus on businesses through two separate apps. Hangouts Chat is built for team-based messaging while Hangouts Meet handles video conferencing. Because of the switch from a service for consumers to a service for businesses, SMS support isn’t needed. Plus, with enhanced messaging around the corner for all Android phones, Android Messages should be where everyone on the platform is ushered to. Removing SMS support from Hangouts for Android could mean that Allo, Google’s AI-driven messaging platform, is on the verge of gaining it. When Allo launched at Google I/O 2016, many were disappointed that it lacked SMS support. Even today consumers still request the feature to Google employees on social media. With Hangouts losing SMS support, everyone is going to expect it come to Allo shortly after Google I/O 2017.